Clarity Grading: What is loupe clean, eye clean, etc.? Nervous about ordering from an overseas company? Cutting styles: What are the differences? Low prices: your gems look great but how can I be sure I will get a quality gemstone? Different prices: Similar looking gems sometime have very different values. Burmese Rubies: Why are Burmese Rubies the most expensive rubies? Synthetic: Are any of your gems synthetic or created? Star or Cat's Eye: How to best view the Star or Cat's Eye in a gemstone that has one? Prices: How can your prices be so low? Memos: Do you memo stones? - Review your shopping cart then choose your payment method. - Enter your billing information to complete your order. We will send you an E-mail with all order details verifying your purchase. 2. How can I pay for my gemstones? Paying by Credit Card on-line. We accept Visa, MasterCard and Discover cards. You can safely enter your entire credit card number via our secure server, which encrypts all submitted information. We're sorry that we no longer accept American Express, since Amex will not refund transaction fees when a gem is returned. If you use your Visa, MasterCard or Discover card to make your purchase, you will not be charged transaction fees if you need to return a gem. Or if you would like you can choose to pay by credit card without sending us your credit card information online. If you prefer this option, you can fax a copy of the Order Confirmation which we will send you with your credit/debit card details to + 66-2 237-8354. You can also Wire Funds or make a Direct Deposit, please use any branch of Bank of America Or HSBC Bank, bank details will be emailed to you with your order confirmation. Paying by Gift Certificate or Credit Coupon. If you have received an AJS Gems Gift Certificate or Credit Coupon, congratulations (Happy Birthday etc.). To use the Gift Certificate or Credit Coupon simply type the code into the Coupon Box on the Checkout Page and click "Apply" to recalculate the total. If your Gift Certificate or Credit Coupon is more than the cost of your order, we will place the balance in your account. 3. What about shipping and insurance? UPS Express US / Non Europe (Air) - - US$ 39.50 : 2-4 Business days. No Sunday delivery. Signature upon delivery is required. Cannot be shipped to P.O. Boxes or FPO/APO. Parcels can be tracked on line at every step. UPS Express Europe (Except France - Air) - - US$ 45.00 : 3-5 Business days. No Sunday delivery. Signature upon delivery is required. Cannot be shipped to P.O. Boxes or FPO/APO. Parcels can be tracked on line at every step. Not recommended for France (Registered Mail is Recommended), or Russia where your shipment may be subjected to taxes and extra customs clearance charges. Registered Mail Worldwide - US$ 8.50 : 10-30 business days (worldwide) No Sunday delivery. Signature upon delivery is required. Can be shipped to P.O. Boxes or FPO/APO. Registered mail is inexpensive and generally reliable but it cannot be tracked on line. In the event you do not receive your parcel the post office can begin a trace 30 days after shipping. Note to Canadian customers -- we have had reports of slow delivery for registered mail to Canadian addresses. We recommend UPS Express shipping for Canadian orders. Insurance is mandatory and is 1% of the total. If UPS has authorization to release parcels without your signature (called a 'Release Signature on File'), please call UPS to revoke the authorization. A UPS package left without a signature because UPS has a 'Release Signature on File' for your address, Will Not be Covered By Our Insurance Carrier. Orders are shipped from Bangkok the next work day after your payment has cleared. Shipping and Insurance are Not refundable. Customer satisfaction is our top priority. If you are not completely satisfied we are pleased to offer a fourteen (14) day return policy on all purchases. If within 14 days of receiving your gemstone(s) you become dissatisfied with it, return it in its original undamaged, unaltered condition for a refund or a credit. No questions asked, no hidden restocking fees, no credit card charges. Please Send us an Email asking for Return Instructions. The shipping & insurance fees are not refundable. All returned merchandise must be sent by registered mail (no FedEx, UPS, DHL, etc..) Appropriate return packaging and registered mail fees are the responsibility of the customer returning the merchandise. We will insure all returned items at our own expense. After 14 days all sales are final (returned items must be postmarked within 14 days of the date you received the items). If you decided that you do not want the merchandise after it has been shipped but before it arrives, Please Do Not Refuse Fedex or Postal Delivery. All Items must be returned to us only by registered mail we must insure these items using the registered mail receipt number. If the merchandise is refused you will be liable for the full value of the item or items if lost and all brokerage charges and duty incurred upon its return. 5. Gemstone Clarity what is loupe clean, eye clean, etc.? All our gems are accurately graded for clarity. Loupe Clean: When looking into the stone using a 10x magnification loupe the stone is inclusion free. Almost Loupe Clean: When looking into the stone using a 10x magnification loupe the stone may have some small inclusions that can only be seen using 10x magnification. Eye Clean: Inclusions inside the gemstone are not visible without magnification. Very Very Slightly Included: The gemstone has small inclusions inside that are hard to see or can only be seen from certain angles. Very Slightly Included: The gemstone has small inclusions that are visible only on close inspection. Slightly Included: The gemstone has small inclusions that are visible to the eye but not easily seen. Moderately Included: The gemstone has more pronounced inclusions that are visible. Included: The gemstone has many visible inclusions. Please note: Clarity grading is done when looking closely at loose unset gemstones. Setting gemstones often hides many if not all of the inclusions. Important Note: All gemstone are not created equal what is acceptable in one stone maybe unacceptable in another. For example, Burma Ruby is usually much more included than Blue or Yellow Sapphire and Rubellite Tourmaline is commonly much more included than other Tourmalines. Gemstone certificates state that gemstones are natural and not man made, they are not appraisals of value. We suggest that if you want a gemstone certificate you get one from an independent gemstone laboratory. We do guarantee all our gemstones to be natural. If you would like to have a certificate from a gem lab, certificates are available from GemResearch Swisslab; Tokyo Gem Lab, AIGS (Asian Institute of Gemological Sciences) or GIT (The Gem and Jewelry Institute of Thailand, Chulalongkorn University). Click here for more information on Gem Certification. 7. I have never ordered a stone from overseas and am a little nervous. We know first time customers may be apprehensive about buying on line especially from a company so far away. That's why we put on line all the nice E mails we get from our customers. We are very proud to have so many people take the time to write to us. If you have the time please go to our customer testimonials pages to see what other have to say about us. Please take a look at the very nice article about colored stones in The Wall Street Journal where AJS Gems is mentioned as a prime source for fine gemstones. We pride ourselves as a company that does business as openly and honestly as possible. That's why we do most of our daily sale with repeat customers. 8. What about the differences in cutting styles? There are many styles of cutting but there is no one style that is right for every stone. The Gemstones that we sell are all natural and we cut our fine gemstones in a way that will bring out their true beauty for you to enjoy. We employ master cutters who use their imagination in cutting our gems to insure the best possible finished gemstones. We use many different styles of cutting to make our finished stones as nice as possible. Heated when done in a natural environment without chemical enhancements is accepted in the trade as a natural enhancement.... It is not to be confused with gemstones that have been heat treated with light elements or other chemical enhancements that may alter the color of the stone... Most natural colored gemstones are heat treated to intensify their color diminish imperfections or improve durability. Heating gemstones in an oven is a treatment that has been done to fine gemstones for hundreds of years. Unheated means the enhancement is none, no enhancement or any treatment. Enhancement byLattice diffusion: Corundum (all ruby and sapphire) that show indications of having undergone heating accompanied by the introduction/diffusion of chemical elements(s) (facilitating the modification or creation of color) from an external source shall be described as species natural corundum, variety, sapphire/ruby, comments: indications of heating, lattice diffusion of a chemical element(s) from an external source or the introduction of a chemical element(s) from an external source. Treatments are disclosed on our stone description page except in cases where the information is unavailable. 10. Who runs AJS Gems Limited and where is it? 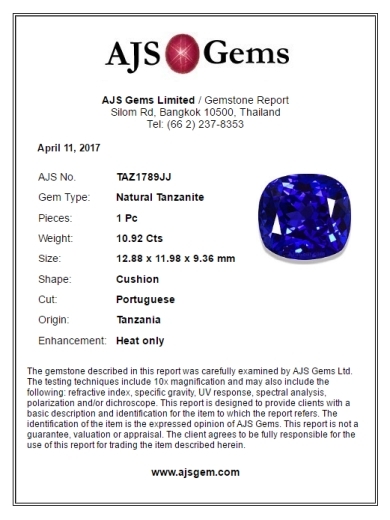 AJS Gems is an American managed company. Arnold Silverberg, our Managing Director, has been buying and selling gemstones for more than 40 years. His experience and knowledge have established him as one of the main gemstone authorities in Asia. Rungrawee Wongpraneekul, our general manager, has many years of experience in dealing with all kinds of gemstones precious, semi-precious, rough and cut. She is always willing and available to help you find the right gem. AJS is incorporated in Thailand the center of the gem mining and processing industry and the undisputed "Gemstone Capital of the World". See our "Contact US" page for full details on how to visit or contact us. AJSGEM.COM Safe Shopping: While shopping at ajsgem.com you never have to worry about credit card safety. Safe Technology: All transactions within our website go through SSL (Secure Socket Layers). Our secure server software (SSL) is among the best available today for secure commerce transactions. All of your personal information is encrypted, including credit card number, name, and address, so that it cannot be read as the information travels across the Internet. 12. What is your policy regarding customer privacy? *Contact information from the order form is used to send orders to our customers. * Financial information that is collected is used to bill the user for products and services. * Persons who supply us with their telephone numbers will only receive telephone contact from us with information regarding orders they have placed on-line, or from our shipper regarding delivery of your order. In order to provide a personalized shopping experience at AJS Gems, we do use and collect cookies. “Cookies” are small pieces of information that are stored by your browser on your computer's hard drive. Our cookies do not contain any personally identifying information, but they do enable us to provide features and to store items in your shopping cart. Most web browsers automatically accept cookies, but you can usually change your browser to prevent that. You will need to accept cookies in order to use most of the features in our store, including placing items in your shopping cart and purchasing them. Gemstone certificates state that stone(s) are natural and not man made, they are not appraisals of value. If what you want is an appraisal you should get it from an independent appraiser. By dealing with someone independent of the sale you will get their true opinion of the quality and value of the gemstone in question. Since they did not sell you the stone they have no reason to tell you the stone is good or bad. 14. Which is the best stone ? For color saturation, light refraction, clarity and value? We take original pictures of every gemstone. We do our best to ensure that the color and saturation is as close as possible to the original stone. Please use our pictures and our prices to compare quality and value. Our pictures also tend to accurately show light refraction as well as imperfection and cutting characteristic color zoning and windowing if any. You can feel confident in using our pictures and prices to compare gemstone on our site. We take great care with our stone pictures and accurately price our stones according to quality and value. We offer these stones in a wide range of qualities and prices. Our gemstones have been carefully graded and our price reflects the quality of each stone. Please remember that a $100.00 stone will always be better than a $50.00 stone. Please shop and compare we are confident that what we sell, will meet your expections. 15. The gems on your site look great and your prices are low but how can I be sure that I'll receive a quality gemstone? All our stones represent good value for the money. We guarantee our description will be as accurate as possible. We take original pictures of every gemstone. We guarantee that the gem you see will be the gem you get. We believe for Value we are the Best on the Net we are Source Supplier we have the best prices. But Please remember that all Gemstones have a wholesales market value and no one will sell you a $500.00 Gem for $50.00. If they tell you they are you better look elsewhere. We've been in the gem business for many years and intend to continue operating for many more. Our personal and corporate policy is to develop regular satisfied customers who choose to do all their gem buying from AJS Gems. 16. Why do some similar looking gems have different prices? The value of a gem is determined by type, size, color, clarity, rarity, and popularity. Even small differences in the hue or the intensity of the color can make a big difference in price. These same small differences in clarity and cut can also create substantial price differences in gemstones. We take original pictures of every gemstone. We always do our best to ensure that the color and saturation is as close as possible to the original stone. We offer gemstones in a wide range of qualities and prices. Please use our pictures and our prices to compare for quality and value. You can be assured that all our stones represent good value for the money. Remember that a $100.00 stone will always be better than a $50.00 stone. So shop and compare, we are confident you'll be pleased with our prices and our quality. 17. Why are Burmese Rubies more expensive than African and Thai Rubies? Simply because Burma Rubies are considered the best in the world. They display the best red to pink red color with little or no brown over tones. As with every colored gemstone the most important thing is the color and BURMA RUBIES are the best. Although African ,Thai and Burmese rubies are the same in terms of chemical and physical properties they do differ noticeably in color and hue. Burmese rubies are usually a more true red color in most kinds of light. While African and Thai rubies are usually a darker color with brown overtones somewhat like a garnet. 18. Are any of your gemstones synthetic or created? All of our stones are 100% natural – no created or synthetic stones. 19. How can I see a Star or Cat's Eye in a gemstone? Stars and Cat's Eyes can be seen in some Gemstones. This effect can be seen if you look at the stone in direct sun light, in dim light by shining a flash light on the stone or by looking under a spot light. Under most normal indoor lighting conditions you will not see the star this is normal with natural stones....the star is a phenomena cause by a reaction to direct light. 20. Why do need my phone number and the phone number of the person to whom I want to ship my order? The phone numbers allows us to contact you if there's any questions about your order. The shipping companies require the phone numbers of the intended recipient so they can contact them if there is any problems with their delivery. 21. How can your prices be so low? Most jewelers and collectors are amazed at our low prices. We can offer such great values because we buy our gems directly at the mines or from the miners themselves in Southeast Asia and Africa. We pass the savings on by eliminating the middleman. 22. Are you willing to memo stones? We do not memo stones. 23. How should I view your images on my LCD monitor? If you use an LCD flatscreen monitor, the color and tone of your screen image can change noticeably depending on viewing direction. When you view your LCD monitor from the side, you will notice a loss of screen brightness and possibly a change of displayed colors. Please be sure to view any gemstone image straight-on and in the center of your computer screen for an accurate representation of the stone's true color. 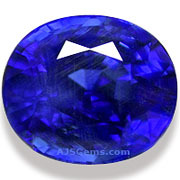 The real gem is a true Royal Blue color, as should be seen by viewing the image from straight- on. Now angle the monitor or move your head until your viewing angle is almost parallel with the computer screen. Notice that the gem becomes almost purple! Also, when viewed from above, the stone can appear much lighter (and with this stone, redder), while from below the gem is much darker and more deeply blue. For the most accurate depiction of the true color and tone of our gemstones, be sure to keep the image directly in front of you. If you are viewing our stones with another person, take turns viewing the stone from the straight-on position so you can both be sure to see the gem as it truly is.